Turkish tea (Turkish: çay) is a type of tea originating in Turkey and popular among most people living in the Turkic speaking world. In its method of preparation and service it resembles Russian tea more than the British or Chinese forms. 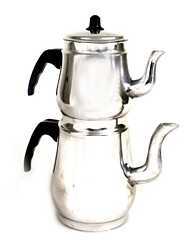 Turks make use of a tea maker similar to a Russian samovar to brew their tea, which is served in glasses rather than cups. 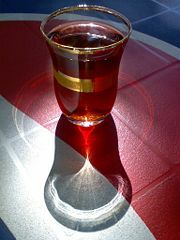 Turkish tea has become as popular as, if not more so than, Turkish coffee, particularly among younger people in Turkey. In fact, tea has become an integral part of Turkish culture. The serving of tea reflects the hospitality of a family to guests, and is an enjoyable accompaniment to any meeting whether for business or pleasure. Tea gardens are popular for family outings, and welcoming of children as well as adults. Turkey is also a significant producer of tea, primarily from the Rize province bordering the Black Sea which has an ideal climate for tea production. The development of Turkish tea has thus been an asset to Turkey in many ways. Packs of Turkish tea (Rize turist cayi and Tomurcuk). Turkish tea, called çay ultimately from the Chinese word chá (茶) meaning tea, is a form of black tea. Within Turkey, the tea is usually known as Rize tea and comes from the Rize province on the eastern Black Sea coast. The Turks developed their own way of making and drinking this tea, which became a way of life for Turkish culture. Wherever people go in Turkey, tea or coffee will be offered as a sign of friendship and hospitality, at homes, bazaars, and restaurants, before or after a meal. Turkey one of the largest tea markets in the world, with consumption reckoned as the highest per capita in 2004. The way tea is prepared and drunk in Turkey is somewhat unique, similar to Turkish coffee in its strength and caffeine content, and related to that of the Russian method using a samovar. Tea became the widely consumed beverage of choice in Turkey only relatively recently, in the 1930s. In 1878, Mehmet Izzet, governor of Adana, had published the Çay Rişalesi (Tea Pamphlet) describing health benefits of drinking tea. This led to the opening of several tea houses in Istanbul, although coffee remained the preferred hot beverage at the time. When the Ottoman Empire collapsed in 1923, the Turks lost Mocha in Yemen, and coffee became an expensive import. The nation's founder, Atatürk, encouraged tea as an alternative to Turkish coffee, which had become expensive and at times unavailable in the aftermath of World War I. Coffee had to be imported, mainly from Brazil, whereas tea was easily sustainable domestically. The Turks turned to tea. 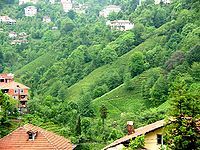 Finding that the Rize Province on the eastern Black Sea coast had an appropriately mild climate with high precipitation and fertile soil, the Turks began to produce their own tea, Rize tea. The first tea plantations were started in 1924 in Rize, with tea seeds brought from neighboring Georgia. Rize tea or Çay is a form of black tea and produces a crystal clear liquid that is mahogany in color. The tea is produced without additives or chemicals during either the growing or processing stages. After picking, the tea leaves are withered for a time to reduce their water content and then rolled by machine to facilitate the oxidation process essential to the fermentation that produces black tea. Brewed for a long time, at least 15 minutes, this tea is then mixed with hot water and sweetened with sugar to taste. As in other Muslim countries, tea (and to some extent still coffee) takes the place of alcohol as the social beverages. Turkish tea became popular everywhere, drunk at any time. In 2004, Turkey produced 205,500 tonnes of tea (6.4 percent of the world's total tea production), which made it one of the largest tea producers in the world. Furthermore, in 2004, Turkey had the highest per capita tea consumption in the world, at 2.5 kg per person—followed by the United Kingdom (2.1 kg per person). Turkish tea is typically prepared using two stacked kettles (çaydanlık) especially designed for tea preparation. Water is brought to a boil in the larger lower kettle and then some of the water is used to fill the smaller kettle on top and steep several spoons of loose tea leaves, producing a very strong tea. When served, the remaining water is used to dilute the tea on an individual basis, giving each consumer the choice between strong (Turkish: koyu; literally "dark") or weak (Turkish: açık; literally "light") tea. Turkish tea is full-flavored and too strong to be served in large cups, thus it is always offered in small tulip-shaped glasses which show off its color. These glasses are usually held by the rim in order to save the drinker's fingertips from being burned, as the tea is served very hot. Turkish tea drinkers often add lumps of sugar, but milk is not traditional. A glass of Turkish tea. There is a folk saying in Turkey that "Conversations without tea are like a night sky without the moon," revealing the extent to which tea has become an integral part of Turkish culture. Tea is served with meals, at social gatherings, business meetings, and is available on the street from vendors shouting Çay! People drink tea at home, at work, when visiting friends, and on all social occasions. Workplaces often employ a person just to make tea and coffee for the employees, and the first thing that guests are offered is tea in the traditional tea glasses. Thus, Turkey leads the world in per capita consumption of tea. The tea glass is so ubiquitous in Turkish life that it is often used as a measurement in recipes. Turkish tea is generally served with little sweetmeats, although the tea itself is also sweetened with sugar. In the Eastern part of the country it is common to place a sugar cube under the tongue before sipping the tea from the glass, rather than adding the sugar to the liquid. Turkish tea is served in cafés by a çaycı (tea-waiters). Serious tea-drinking Turks often go to a tea house or Çay Bahcesi (tea garden) where they serve it with a samovar (Turkish: samever) or urn, and patrons can refill their glasses themselves as much as they want. Tea is an essential part of social events, particularly in rural areas. Bridal showers would not be complete without samovars of tea, and wedding celebrations may be held in tea gardens. Çay Bahcesi or "tea gardens" are popular all over Turkey, as relaxed environments where friends and colleagues can enjoy companionship while drinking Turkish tea. In rural areas particularly, tea gardens may be separate for men and for families; in larger cities, though, such segregation is uncommon. In large cities and tourist areas, all are welcome, including many foreigners. No alcohol is served in tea gardens; tea is the main drink although coffee is also served. In Istanbul, tea gardens gained popularity in the 1950s, becoming a popular place for families to go for social outings. The Turkish tea garden is very different from the garden of a Japanese tea house, which was developed to provide a quiet and serene environment for the Japanese tea ceremony. By contrast, Turkish tea gardens are "hubs of social activity with kids running around, music playing, and lively conversation among various groups from students, to businessmen to retirees and foreigners." In Turkey, herbal teas are also popular, with apple (elma çayı), rose hip (kuşburnu çayı), and linden flower (ıhlamur çayı) being the most popular flavors. Sage tea (ada çayı, also called "island tea") is most popular in the Mediterranean coastal region. ↑ 1.0 1.1 1.2 Euromonitor International, Turkey: Second biggest tea market in the world. Retrieved February 25, 2009. ↑ 2.0 2.1 2.2 2.3 2.4 Pelin Aylangan, Turkish Tea, Turkish Cultural Foundation, 2006. Retrieved February 24, 2009. ↑ Mary Lou Heiss and Robert J. Heiss, The Story of Tea: A Cultural History and Drinking Guide (Berkeley, CA: Ten Speed Press, 2007, ISBN 978-1580087452). ↑ 4.0 4.1 Debbie Kwiatoski, Turkish Tea: Brewing and Drinking Tea in Turkey, Suite101.com (Jul 4, 2007). Retrieved February 25, 2009. ↑ Food and Agriculture Organization of the United Nations, World tea production reaches new highs, FAO Newsroom (July 14, 2005). Retrieved February 25, 2009. ↑ Jane Pettigrew and Bruce Richardson, The New Tea Companion (Perryville, KY: Benjamin Press, 2008, ISBN 978-0979343179). Aylangan, Pelin. Turkish Tea. Turkish Cultural Foundation, 2006. Retrieved February 25, 2009. Gautier, Lydia. Tea: Aromas and Flavors Around the World. San Francisco, CA: Chronicle Books, 2006. ISBN 978-0811856829. Heiss, Mary Lou, and Robert J. Heiss. The Story of Tea: A Cultural History and Drinking Guide. Berkeley, CA: Ten Speed Press, 2007. ISBN 978-1580087452. Kwiatoski, Debbie. Turkish Tea: Brewing and Drinking Tea in Turkey. Suite101.com, Jul 4, 2007. Retrieved February 25, 2009. Pettigrew, Jane, and Bruce Richardson. The New Tea Companion. Perryville, KY: Benjamin Press, 2008. ISBN 978-0979343179. All links retrieved June 18, 2014. This page was last modified on 18 June 2014, at 21:51.